1 violin, 2 violins, 3 violins, 4 violins… This concert celebrates the virtuosity and variety of the violin, from solo sonatas all the way to concerti grossi. The performance hall at the Yale Collection seats only 96–100 people. The concert will also be live-streamed. The Sebastians perform with New Jersey’s Harmonium Choral Society, with Anne Matlack, conductor, and featuring Dann Coakwell as Evangelist. In 2019, the Sebastians and TENET Vocal Artists are teaming up again to present Bach’s even more stunning St. Matthew Passion, which features two orchestras and two group of vocal soloists! This unconducted performance features an exceptional orchestra and cast of singers, and it is truly the highlight of our season—a MUST-SEE for all New York music-lovers. Jeffrey Grossman will lead the two ensembles from the chamber organ with tenor Aaron Sheehan as the Evangelist and Tyler Duncan as Jesus. Daniel S. Lee leads the first orchestra and Nicholas DiEugenio the second, for a special experience: the St. Matthew Passion as chamber music. Nicholas DiEugenio and Jeffrey Grossman present J.S. Bach’s two sonatas and fugue for violin and continuo, surrounded by complementary pieces by Bach’s contemporaries. Often overlooked by performers, the two sonatas, gems of the chamber music repertoire, highlight multiple facets of his musical personality—sweet and joyful (the G major sonata), dark and unsettled side (the E minor sonata). This program is the perfect complement to the November 10 concert of Bach’s six sonatas for violin and obbligato harpsichord. The musicians of the Sebastians have long looked forward to putting their personal stamp on Handel’s beloved Messiah. For the first time ever, the Sebastians and TENET Vocal Artists will present their unique take on the time-honored masterwork this December. With a choir of only twelve amazing vocal soloists and an orchestra of only fifteen remarkable instrumentalists, the Sebastians and TENET highlight the majesty as well as the intimacy of Messiah. From textures as humble as a single violin, singer, and continuo, to the awe-inspiring excitement of the full ensemble—including trumpets and timpani!—Handel’s genius has never been better showcased. Daniel S. Lee and Jeffrey Grossman present the complete sonatas for violin and obbligato harpsichord by Johann Sebastian Bach—these six sonatas are not only finely crafted, intricate, and beautiful pieces, but represent a historically important step in the development of the keyboard in chamber music. The Sebastians, the Collection’s ensemble-in-residence, perform works by Roman and Venetian baroque composers, as well as Couperin’s L’apothéose de Corelli, inspired by the great Roman master. The musical journey through the development of the trio sonata genre begins with sonatas and dances by Venetian composers, Dario Castello and Tarquinio Merula. After exploring trio sonatas by Roman composers including Giovanni Battista Fontana and Arcangelo Corelli, the program returns to Venice with the grand finale: Antonio Vivaldi’s La Folia. Sensational harpist Bridget Kibbey, declared “a marvel” by The New York Times, will join forces with members of the Sebastians, an ensemble known for “elegant string playing… immaculate in tuning and balance” (Early Music Today). J.S. Bach’s monumental Toccata & Fugue in D minor will be part of their inspired program that re-imagines masterpieces of this Baroque master, adapted by Kibbey for harp and early-instrument string quartet. The Sebastians and TENET are thrilled to join forces again for a transcendent concert of sublime cantatas by the German baroque composer Dieterich Buxtehude and instrumental works by his compatriots Handel, Biber, and Kerll. This stirring program is an invocation of hope, calling forth from despair and light from darkness. Our grand season finale juxtaposes the Italian virtuosity of Bach’s Brandenburg concerti with the French elegance of his Orchestral Suites—back to back. Rarely performed together, these magnificent works reveal two sides of Bach’s musical personality and feature an exceptional variety of instrumental colors: seductive flute, playful oboes and bassoon, majestic hunting horns, exhilarating harpsichord, and even the brilliant violino piccolo, played by our own in-house specialist, founding director Daniel S. Lee. 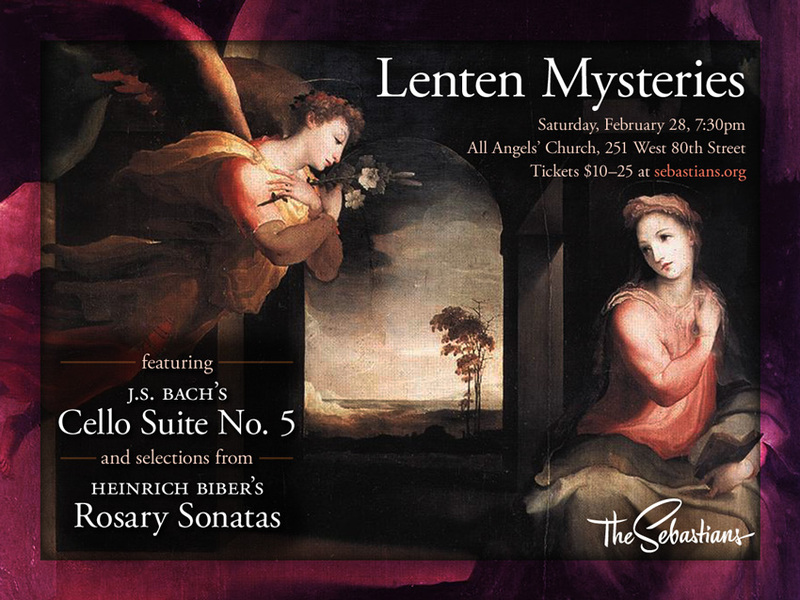 The Sebastians and TENET, following last season’s acclaimed St. John Passion, are thrilled to join forces again for a transcendent concert of sublime sacred cantatas by the German baroque composer Dieterich Buxtehude and instrumental works by his compatriots Handel, Biber, and Kerll. This stirring program is an invocation of spring, calling forth hope from despair and light from darkness. NOTE: This performance has been cancelled due to inclement weather. 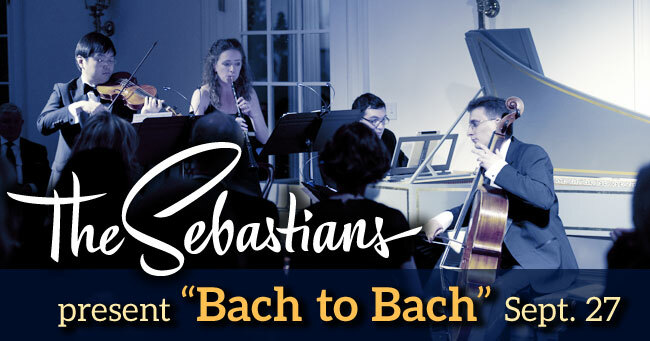 The Sebastians celebrate Bach and his influence in this sparkling program including works by Corelli, Handel, Vivaldi, and the master himself. Tickets now available online! Their program of High Baroque trio sonatas explores the variety of styles used by composers of different nationalities. Built around François Couperin’s Les Nations, it includes works by Arcangelo Corelli, William Boyce, and George Frederic Handel, ending with the Sebastians signature rendition of Antonio Vivaldi’s Folia. The Sebastians present a program of elegance, wit, and passion in a journey back in time through two of Mozart’s important artistic centers—Salzburg and Vienna. Salzburg, the sleepy provincial city where Mozart’s father was a court violinist and Kapellmeister in the 1740-60s, was in the previous century home to two influential composers in their own right—Heinrich Ignaz Franz von Biber and Georg Muffat. Biber, regarded as one of the greatest violinists of his time, worked for most of his life in the Salzburg court and developed groundbreaking techniques in string writing. Muffat also worked as a court musician in Salzburg for ten years during his cosmopolitan career. The Sebastians top off this program with their signature rendition of the Follia by Antonio Vivaldi, who settled in Vienna in his final years. The centerpiece of this varied program is Mozart’s Concerto in A, K. 414, which will be performed by Yi-heng Yang on a fortepiano built in the style of Mozart’s own instrument, recreating the incisive and dramatic sounds of his musical language. Not only does the stylistic juxtaposition of Mozart with his Baroque predecessors cast the beloved Classical genius in an arresting new light, but the combined collection of composers becomes a fantastical historical journey through two of Europe’s most musical cities. What does it mean to be a German, French, or Italian composer? In the 18th century, as national identity became more defined, composers grappled with that question, expressing their emerging national styles while also freely borrowing from others. This cosmopolitan program of Corelli, Telemann, Couperin, Muffat, Boyce, Royer, and Handel brings to life an enchanting diversity of styles. Tickets available online or at the door. What does it mean to be a German, French, or Italian composer? In the 18th century, as national identity became more defined, composers grappled with that question, expressing their emerging national styles while also freely borrowing from others. This cosmopolitan program of Corelli, Telemann, Couperin, Muffat, Boyce, Royer, and Handel brings to life an enchanting diversity of styles. In the seventeenth and eighteenth centuries, Amsterdam was a thriving musical “port city”—one of the few places composers sent their precious manuscripts to be published, and from there, disseminated across Europe. In this concert, the Sebastians explore chamber music by Locatelli, who made Amsterdam his home, and his Italian compatriots who published there: Corelli, Mossi, Somis, Vivaldi, and Lully. As a tercentenary tribute to Mr. Handel and his Water Music, Music in the Somerset Hills is proud to present an outdoor, on the water performance of this work at the Lake Club in Far Hills on Saturday, June 24 at 8:30 PM. On a platform built out into the lake (no royal barge being available), Stephen Sands will conduct the well-known early music ensemble, the Sebastians, in performances of the Water Music and a contemporary work almost as famous, the Spring and Summer movements of Vivaldi’s Four Seasons. The rain date is Sunday, June 25. If it is raining again on Sunday, the concert will move indoors to The Pingry School in Basking Ridge. Tickets and more info. 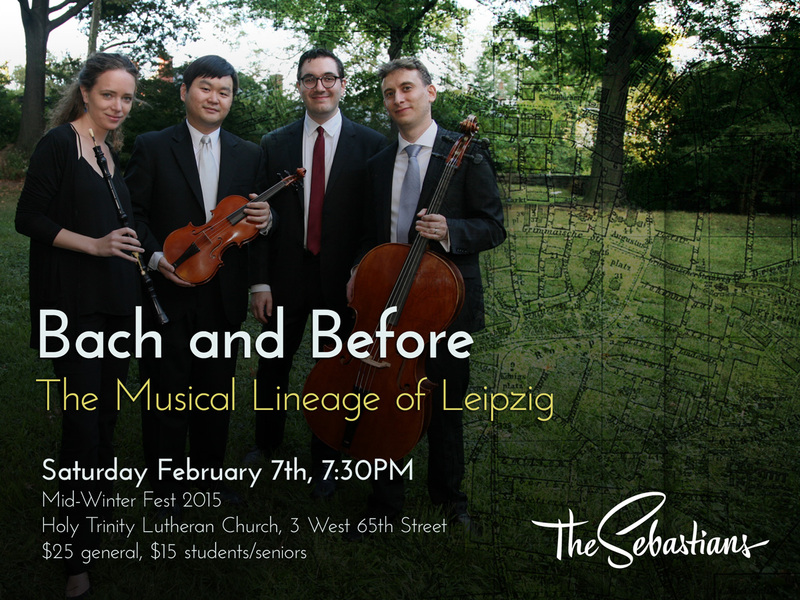 The Sebastians return to beautiful Emanuel Lutheran Church for a sparkling program for baroque violin, flute, cello, and harpsichord, including Bach’s trio sonata from the Musical Offering and works by Bach’s contemporaries, Handel and Telemann. Following a season of grand orchestras and spectacular ensembles, we return for our season finale to chamber music, and the intimacy of the quartet—baroque violin, flute, cello, and harpsichord. 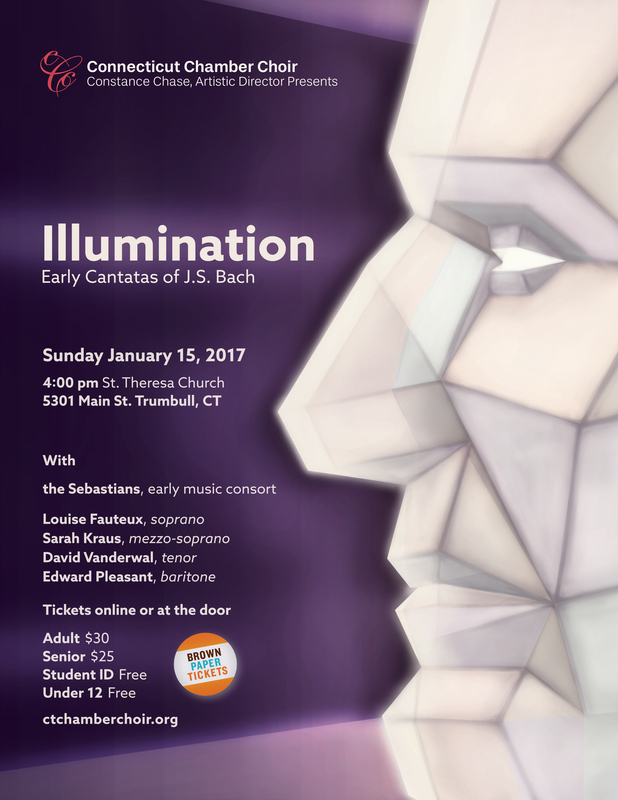 This sparkling program features music by J.S. Bach and his contemporaries, Handel and Telemann, including selections from Bach’s famous Musical Offering. The crown jewel of our season: this unique concert experience promises to present Bach’s Sonatas and Partitas for Solo Violin as you’ve never heard them before. Bach’s six contrapuntal masterpieces will be presented as an installation for you to explore. Come enter “the mind of the master” with the virtuosic violinists of the Sebastians. The Sebastians and TENET are teaming up to present J.S. Bach’s St. John Passion in an unconducted performance with an exceptional orchestra and cast of singers. This spectacular production is truly the highlight of our season, and a MUST-SEE for all New York music-lovers. Jeffrey Grossman will lead the two ensembles from the chamber organ with tenor Aaron Sheehan as the Evangelist. Stephen Sands, the Artistic Director of Music in the Somerset Hills, conducts the Somerset Hills Community Chorus, singing alongside professional soloists, in a performance of Mozart’s last – and uncompleted – work. 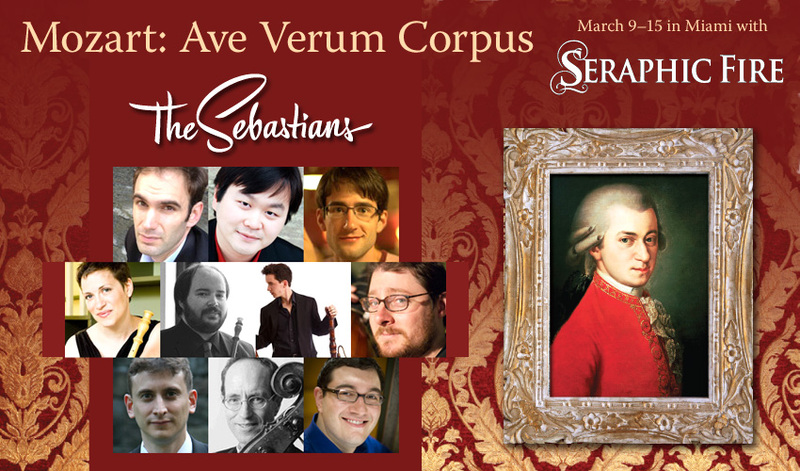 The Sebastians return to New Jersey to continue their collaboration with Music in the Somerset Hills. The beautiful and special sound of classical-era instruments replicates what Mozart would have heard, if he had lived to finish and perform the piece. The massed ensemble will perform Robert D. Levin’s modern completion of the Requiem. Tickets and more information available online. With Louise Fauteux, soprano, Sarah Kraus, mezzo-soprano, David Vanderwal, tenor, and Edward Pleasant, baritone. Tickets available online. 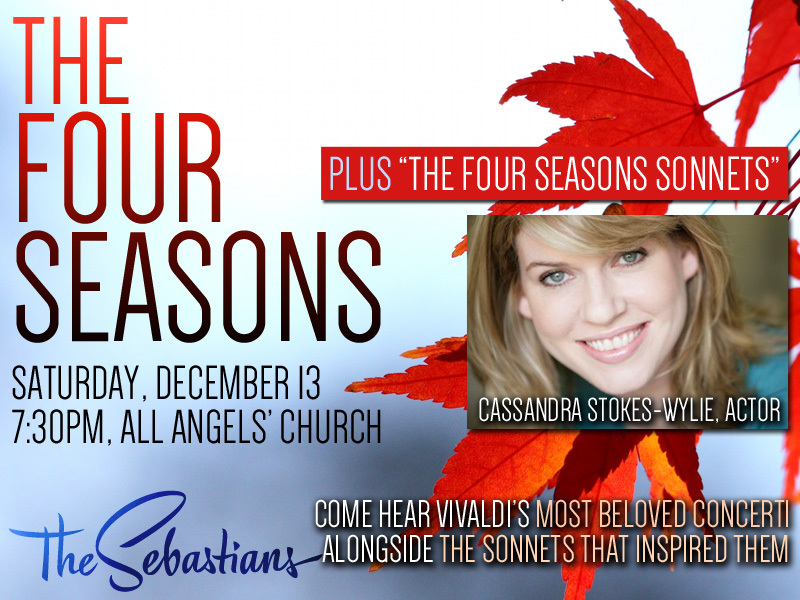 This festive program will center on Vivaldi’s Four Seasons, paired with a newly commissioned companion work by Tawnie Olson. Olson’s unique approach to birdsong will shed new light on the changing of the seasons, and pairing Vivaldi’s concerti with this world premiere will make for one thrilling evening. The new work by Olson will be a reflection, a mirror, and a response to Vivaldi that will help to further enliven and enrich the concert experience for modern listeners. The concert will be bookended with music by J. S. Bach, underlining the direct influence these two composers had on each other, despite never meeting. Avaloch Farm Music Institute provides a unique opportunity for chamber music and jazz ensembles at any stage of development, to have the time and space to work intensively on repertoire, prepare for recordings, concerts or competitions, work with composers on commissions, and forge or reconnect to a group musical identity. The violinists of the Sebastians will be working on projects for the rest of the season, including our innovating program of Bach’s sonatas and partitas for solo violin. The Sebastians trace the musical evolution of the Italian style as it migrated over the mountains to the Austro-German regions. Take a musical journey with baroque violin, cello, harpsichord, and the stunning soprano Awet Andemicael. Vocal and instrumental works by Alessandro Stradella, Handel, Buxtehude, Biber, and other baroque masters. Wine and cheese reception in the Meeting House Art Gallery. Click for tickets and more information. 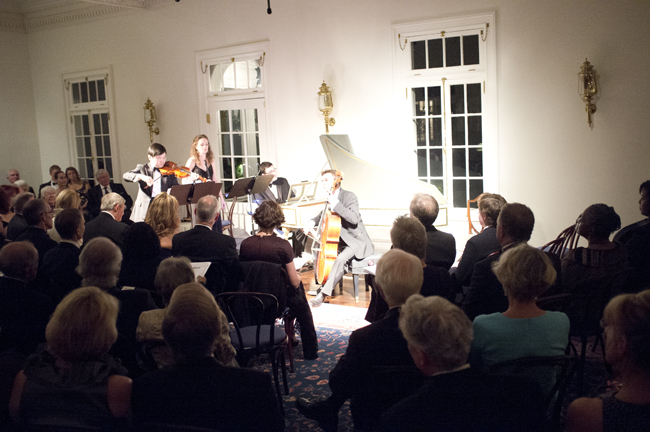 We open our season with a performance of five of J. S. Bach’s Brandenburg Concerti. While these works are widely regarded as some of the most famous orchestral compositions of the baroque period, their diverse instrumentation makes programming more than one concerto in a concert a rare occurrence. Our trumpet soloist John Thiessen was described by The New York Times as “the gold standard of Baroque trumpet playing in this country.” We’re thrilled to have John join our ensemble of exquisite soloists, which includes Priscilla Herreid, Meg Owens, David Ross, and others. The Chelsea Music Festival celebrates great music by bringing together world-leading musicians and exciting newcomers to the international stage in the performing, culinary and visual arts. Earthly and heavenly, natural and spiritual – sometimes the two aren’t so different. From pop songs concealed in liturgy, to opera composers moonlighting as church musicians, Trident Ensemble, and the Sebastians team up to bring you an evening of exuberant sacred music influenced by secular trends. Come celebrate the summer with music by Du Fay, Monteverdi, Lully, Corelli, and more. Thank God (or the tilt of the Earth’s rotational axis) for the warm weather! The Sebastians have teamed up with baritone Michael Hix to unearth the forgotten cantatas of Christoph Graupner. This project will include a performance in NYC and an upcoming CD recording. Sebastians artistic directors Daniel S. Lee and Jeffrey Grossman explore the rich baroque repertoire of music for violin and harpsichord. We’ll be performing an exciting set of large-chamber works as part of the Avaloch Farm Music Institute’s showcase at National Sawdust, Williamsburg’s newest and coolest music venue. More details coming soon! After an overwhelming response to its 2013 performances of Mozart’s Requiem, Seraphic Fire presents a command repeat presentation of Mozart’s signature opus. Using Greg Spear’s post-minimalist completion of the work, commissioned by Seraphic Fire, the chorus and orchestra will once again soar in this timeless masterpiece, joined by the period players of the Sebastians. The Sebastians demonstrate their passion for energetic historically-informed performance in this exploration of solo and trio sonatas by Arcangelo Corelli and his contemporaries. As the legendary Orpheus used his music as a rhetorical weapon, Corelli brought a new level of virtuosity and expression to violin playing. Corelli’s infectious harmonic and structural language took Europe by storm, but it was his older Roman compatriots, including Lelio Colista, Girolamo Frescobaldi, and Alessandro Stradella, who set the stage. As the legendary Orpheus used his music as a rhetorical weapon, Arcangelo Corelli brought a new level of virtuosity and expression to violin playing. This intimate program brings you inside Corelli’s musical world via his older Roman compatriots, including Lelio Colista, Girolamo Frescobaldi, and Alessandro Stradella. Buy Tickets Full program. Messiah has rendered audiences speechless since its 1743 sold-out debut. Anchored by the recognizable and triumphant Hallelujah Chorus, Handel’s Messiah is a pillar of Western music—an indisputable masterpiece that must be experienced live. Patrick Dupré Quigley conducts selections from Handel’s magnum opus. Kick off the holiday season and join us for a program of baroque concertos and exquisite Renaissance madrigals, including Corelli’s Christmas Concerto, Handel’s Gloria, and works by Byrd, Guerrero, Palestrina, and more. The performers include soprano Awet Andemicael, the Sebastians, and the Trident Ensemble. Tickets are $50 per person. Reception to follow. The stunning soprano Awet Andemicael Handel’s recently-discovered Gloria, with other music by Vivaldi, Purcell, and Corelli. The “cherry on top” is the Sebastians signature rendition of Vivaldi’s Folia. Audience favorite Awet Andemicael (“enchanting” –Brandenburger Stadtkurier; “exquisite” –Milwaukee Journal Sentinel; “completely winning” –Boston Phoenix) rejoins the Sebastians for a new program of fiery, passionate vocal and instrumental music by Bach, Handel, Vivaldi, and more. Program available online. Handel’s monumental Coronation Anthems, composed in 1727 for King George II and Queen Caroline of England, bring an exciting, regal note to Seraphic Fire’s season. Continuing in the same Royal vein, Seraphic Fire will complete this program with the Florida premiere of Marc Antoine Charpentier’s triumphant Te Deum, a masterwork of the French Baroque style. 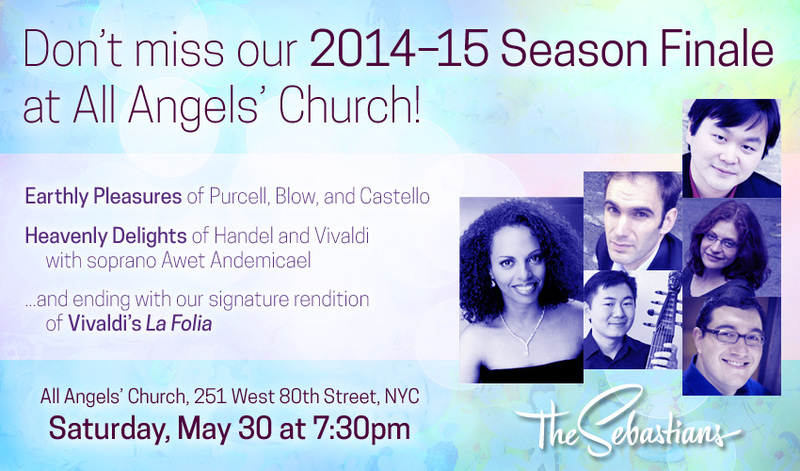 The singers of Seraphic Fire will be joined by the Sebastians to perform these exquisite pieces. 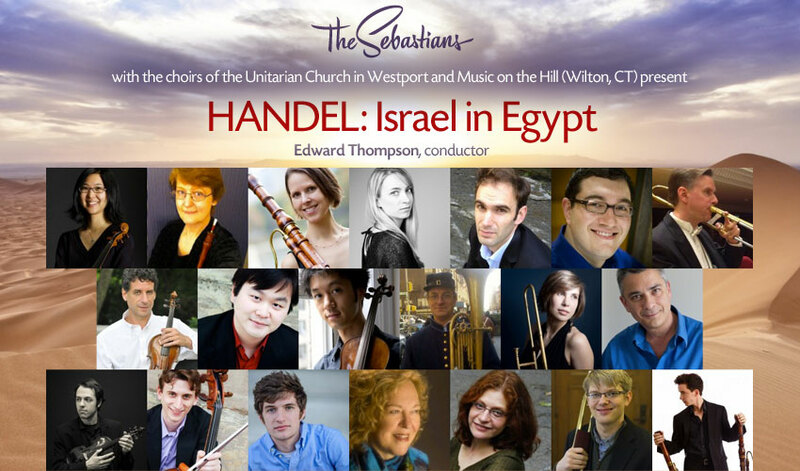 The Sebastians join the choirs of the Unitarian Church in Westport and Music on the Hill (Wilton), under Edward Thompson, conductor for a performance of Handel’s magnificent oratorio, Israel in Egypt. Free tickets are available in advance or at the door. Seraphic Fire opens their 14th Season in a combination of contemporary and canon: a newly-commissioned work by young American composer Jake Runestad, along with Franz Schubert’s Mass in G Major. An evening of sumptuous music, food and ambiance with world class choral musicians and baroque instrumentalists of the Antioch Chamber Ensemble and the Sebastians. Come hear Bach’s motets Jesu, meine Freude, and Lobet den Herrn, BWV 227 and 230 in a beautiful setting. More information available online. 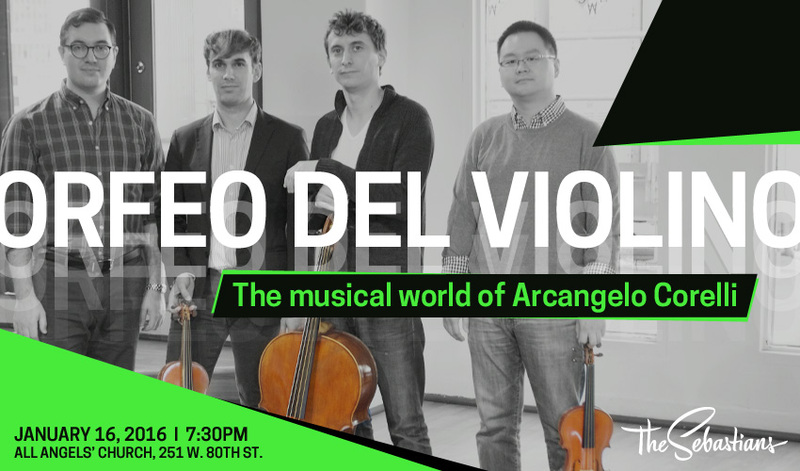 The Sebastians violinists Daniel S. Lee (“fleet-fingered, passionate… soulful” –The New York Times), Nicholas DiEugenio (“evocative” –The New York Times) and Alexander Woods (“showstopping” –The New York Times) present a dazzling display of virtuoso works for three violins and continuo. “All for one and one for all!” Program available online. Daniel S. Lee, scholar and virtuoso, wrote his doctoral dissertation on the violono piccolo. This season he leads the Sebastians in a recording of works for the diminutive instrument by Telemann, Fux, Pfeiffer, Buxtehude, and others. 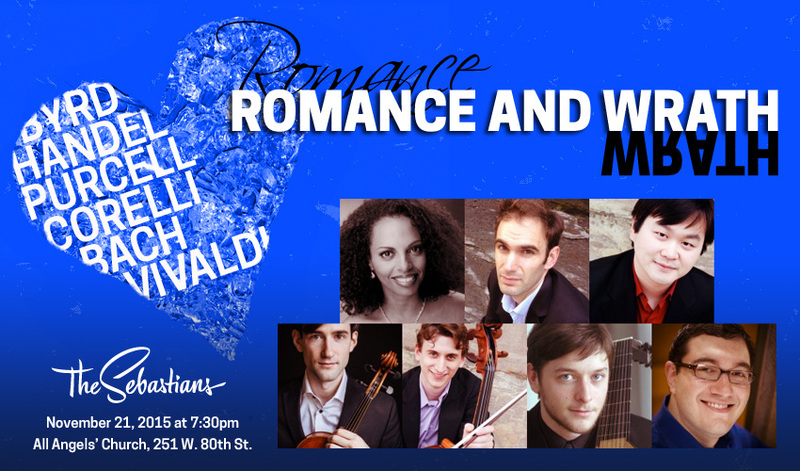 Sacred and secular works by Handel and Vivaldi with soprano Awet Andemicael, featuring our signature rendition of Vivaldi’s La Folia. Full program and ticket info. Vivaldi’s famed Four Seasons—with violinists Daniel S. Lee, Nicholas DiEugenio, and Dongmyung Ahn—paired with the sonnets that inspired them, performed by actor Cassandra Stokes-Wylie. Tickets available online only (no door sales). 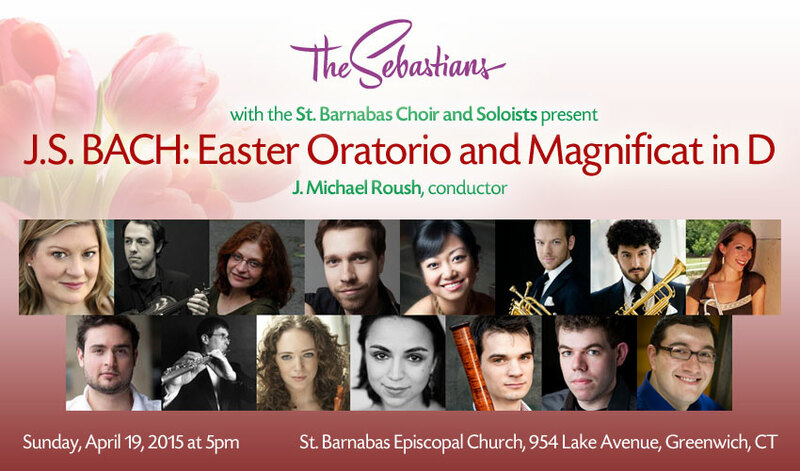 This performance with the St. Barnabas Choir and Soloists will be conducted by J. Michael Roush. Tickets available online. Seraphic Fire’s Founder and Artistic Director, Patrick Dupré Quigley, takes audiences on a signature journey into the mind of Wolfgang Amadeus Mozart to discover the composer’s musical motivation in creating one of his most recognizable pieces: the Ave Verum Corpus. Drawing upon the music of Bach, Palestrina, and other Mozart predecessors, this program of discovery will allow the listener to peek behind the curtain of Mozart’s genius. Biber’s Rosary Sonatas and other evocative works for violin and continuo with the Sebastians core musicians, Daniel S. Lee, Ezra Seltzer, and Jeffrey Grossman. The Lord Nelson Mass has been lauded as “arguably Haydn’s greatest single composition,” by the master’s chief biographer. The profound majesty of this monumental work is a highlight of the Classical era and influenced, among others, the music of Mozart, Beethoven, Schubert, and Brahms. 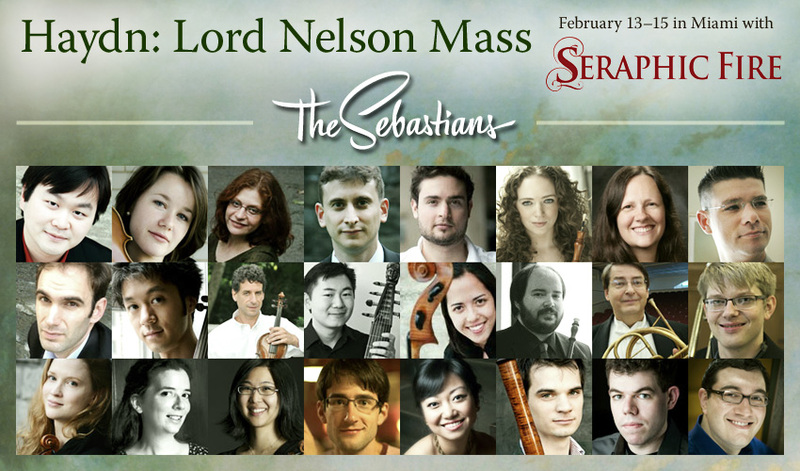 The Lord Nelson Mass will be sung by the expert voices of Seraphic Fire, and, for the first time in Florida, be performed on original Classical instruments by the Sebastians period orchestra. Tickets: $25/$15 Click here to view full program of works. Celebrating the approaching new year with Vivaldi’s famed Four Seasons, with violinists Daniel S. Lee, Nicholas DiEugenio, and Dongmyung Ahn. Antonio Vivaldi: composer, virtuoso, firebrand, genius. Known as the Red Priest by his contemporaries, Vivaldi’s music has triumphed throughout the centuries, captivating audiences for over 300 years. The brilliant singers of Seraphic Fire present Vivaldi’s choral masterpiece, the Gloria, in collaboration with the Sebastians, a New York-based period orchestra praised for their “energetic, youthful, vigorous performing style” by The New York Times, and proclaimed “immaculate in tuning and balance” by Early Music Today. Kicking off our third season as ensemble-in-residence at All Angels’ Church with oboist Priscilla Herreid (Piffaro) in a program featuring music by our namesake, Bach, and his contemporaries. The evening will include a trio of works by J.S. Bach—a trio sonata, a violin and continuo sonata, and the first cello suite—as well as works by Handel, Telemann, C.P.E. Bach, Rosenmüller, and Froberger.